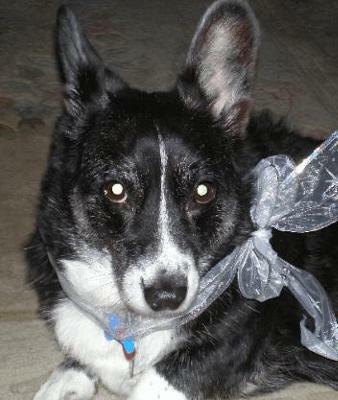 Molly is a Cardigan Welsh Corgi who knows what it is to be spoiled. Kitchen space has been alotted for her ever-growing toy collection. She is the proud owner of a milk crate filled with toys of all shapes and sizes. Her favorites are the stuffed toys such as an accordion style corgi, a lamb, a red bull and a strange spotted elephant. No, we didn't buy her all of these toys. She has somehow made it clear to everyone who visits this house that they need not come unless they bring her something. Since we get company often enough, the collection seems to grow by leaps and bounds. Visitors bags are searched at the door to ensure that there's something new for her to play with. The best prizes are those that have squeakers that can typically be squeaked all night long. And heaven forbid if we try to clean up after all of the toys have been pulled out! "You've messed up my system! ", seems to be a direct translation of the ensuing barks!